Twelve 'sketchers' were out and about in Romsey at the weekend working with artist Katherine Howlett to learn the art of Pen & Ink Architectural Sketching. This was a warm-up for Rum's Eg's 'Sketches of Romsey' community project for Romsey Festival. Rum's Eg are inviting professional and amateur artists to submit work for this special open exhibition in their professional high street gallery. This is their first open entry community exhibition and work must be submitted on 22nd June when it will be judged by a selection committee; all accepted work will be hung on the first and second floors from 2nd to 27th July. As well as conventional sketches of Romsey, the surrounding villages, countryside and people, in all media, Rum's Eg are hoping to see some exciting interpretations and unusual media and materials. Here are a few suggestions of inspirational local subjects: Romsey Abbey (inside and out), King John's House and garden, Saddlers Mill, Market Place, Hillier Gardens, Mottisfont Abbey & Gardens, Broadlands, village churches, River Test, fishing, local wildlife and gardens, people in local pubs and cafes, local sports, events and fetes. The exhibition entry form can be downloaded here. There is another sketching workshop with Katherine on Saturday 21st June. Call 01794 511220 to book. 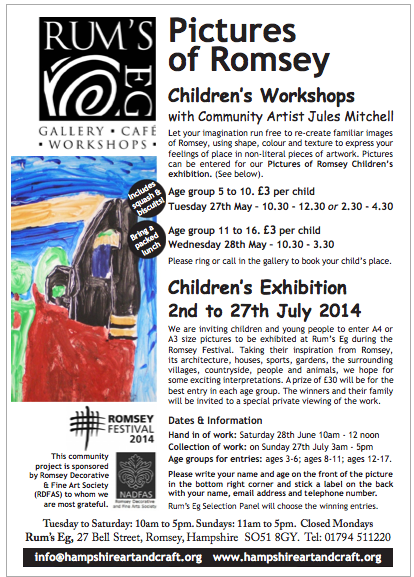 Rum's Eg are also holding art workshops for children on 27th and 28th May and invite children to submit paintings on 28th June for their own 'Pictures of Romsey' exhibition during the Festival. Full details are on their website www.hampshireartandcraft.org or visit the gallery on Bell Street to pick up the details. Local poets Syd Meats and Cat Randle have founded the Teapoet Collective, which will present Romsey’s first poetry cafe at Rum’s Eg, Bell Street on Saturday 24th May as a fundraiser for the venue’s community and outreach programme. They will be joined by guest poets Angela Chicken and Ivor and Kevan Bundell . It promises to be an afternoon of varied and entertaining performances. Angela’s poems are poignant and thought-provoking, Ivor offers observations on subjects as varied as the natural world and the IQ of a carrot, Syd specialises in the humorous and the surreal, and Cat has created the character of a robotic Victorian maid who can’t make tea but desperately wants to. There will be open spots available for audience members. A theme of “gems” has been chosen for this event. Doors will open at 1:30pm, and tickets are £5 on the door. On Tuesday 29th April Rum's Eg hosting a Private View for three new exhibitions: 'Jewellers On Tour', 'Winter and Winter' and 'Little Gems'. The gallery is now bursting with new work and we hope you will come visit soon. The private view was attended by Patrons and Friends of Rum's Eg, the exhibiting Artists and their guests. There was a buzz of excitement as guests had their first glimpse of the new exhibits which it is set to be a very popular exhibition. Many works have already sold and departed for their new home but there are many more beautiful pieces on show. Guests received a glass of wine and delicious canapes were served throughout the evening which had been freshly prepared on the premisesearlier in the evening by the staff of Rum's Cafe. We are inviting professional and amateur artists to submit work for this special open exhibition in our professional high street gallery. The chosen work will be shown at Rum's Eg from 2nd July to 27th July 2014 during the Romsey Festival. As well as conventional sketches of Romsey, the surrounding villages, countryside and people, we hope for some exciting interpretations and unusual media and materials. Hand In/Selection Day for work is 22nd June. You can download the information from the website or pick it up from the gallery. Esther Rantzen visited Rums Eg on Saturday, 29th March. She came to officially open the new Education & Community Suite on the second floor (Leckford Art Studio and Longstock Meeting Room) partly funded by the generous donation of £10,000 from Waitrose Community Matters Fund.The spaces are already getting some great use by various groups and of course own Spring programme of art and craft workshops are happening now through until June. A papercutting workshop was held in the Leckford Art Studio immediately after the opening ceremony by Esther Rantzen. A total of 11 teenagers, including some from Romsey Young Carers, produced some superb papercut Mothers' Day cards and decorations under the tutorage of Kat Hansford. Congratulations! What an asset for Romsey to have this fabulous art and education community centre! I'll be back! We have nearly completed Phase 2 building work: Rum's Cafe on the first floor and the second floor office and educational/community creative spaces. The cafe is doing really well and is already favoured by many regular customers who love our homemade cakes, soups and quiches, and the relaxed and comfortable ambience. and much more - more details very soon! We are also planning to host Crafty Hen Parties (a variety of crafts can be offered, tutored by our artists and lunch and refreshments provided); also Drop -in Drawing Days (untutored, for artists to drop in on a casual basis and draw or paint a prearranged still life, wildlife, flower or human study using their own techniques and materials). In May we are holding two exciting Adult 'Sketchathon' days led by professional Artists Katherine Howlett and Lindsey J Cole who will teach various sketching techniques to be used out and about in Romsey. Work produced on these days may be chosen to be exhibited at Rum's Eg during Romsey Festival in July. In May there will be Childrens' Sketchathon Workshops on 27th and 28th - some of the work will be shown at Rum's Eg during the Romsey Festival in July - more details soon! Craft activities for various community groups are currently being planned. Please keep an eye on our website and Facebook page for updates. Bell Street gallery, Rum’s Eg are delighted to announce that War Horse will be returning to the gallery by popular demand. Rum’s Eg had previously exhibited a thought provoking maquette of a First World War soldier and his horse earlier this Summer, when plans were revealed for a War Horse statue to be erected on Romsey War Memorial Park. The statue is to commemorate the Pauncefoot Hill Remount Camp and the Remount Service where thousands of horses and mules passed through to Romsey to prepare for war. 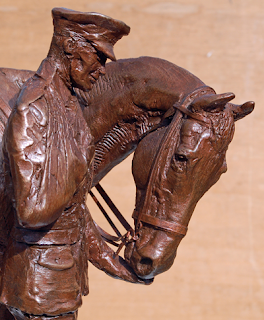 Talented sculptor and creator of the War Horse maquette, Amy Goodman of Quarley, is to undertake the poignant statue project which displays the unbreakable bond shared as they dealt with the horrors of the First World War. The maquette was created as part of a public consultation service for the War Horse project and will show the planned position of the final sculpture.